CHICAGO, Illinois, February 11, 2011 (ENS) – Two hybrid-powered combat vehicles that offer both fuel economy and stealth are on display at the U.S. Army booth at the 2011 Chicago Auto Show, which opened its 10-day run today. The Quantum Technologies Clandestine Extended Range Vehicle, CERV, and the Future Tactical Truck System, FTTS, represent the Army’s next generation joint light tactical vehicles and high performance light duty off-road hybrid trucks. Quantum Fuel Systems Technologies Worldwide, Inc., a publicly traded company based in Irvine, California, said Wednesday that the CERV’s Q-Force hybrid drive system has been optimized for use with an efficient diesel (JP8) engine. The CERV has a 600-mile driving range using the external fuel tanks and has a maximum towing capacity of up to 5,000 pounds. The combat vehicle is configured to maintain speeds of 80 miles per hour (129 km/h), climb 60 percent grades, ford 30 inches (76 centimeters) of water, and perform other unique military requirements – all while using up to 25 percent less fuel than conventional vehicles of comparable size. Quantum’s portfolio of technologies includes electronic controls, hybrid electric drive systems, hydrogen storage and metering systems, and alternative fuel technologies that enable fuel efficient, low emission hybrid, plug-in hybrid electric, fuel cell, and natural gas and aerospace vehicles. The hybrid Future Tactical Truck System was designed to replace the existing wheeled vehicle fleet that proved unable to keep up with current combat operational tempo due to its cumbersome logistical footprint, poor deployability in C-130 aircraft and poor fuel economy, the Army said in a statement Thursday. Fuel can cost run from $30 per gallon when delivered by truck and up to $400 a gallon when delivered by helicopters, the Army said. The FTTS’s hybrid-electric power train doubles the driving range of existing vehicles from 300 to 600 miles. The new Army trucks also will decrease the number of vehicles required to move cargo, equipment and personnel. Fewer trucks means fewer mechanics are needed and fewer tools are required since the advanced software and sensors of the Future Tactical Truck System enhances its reliability. 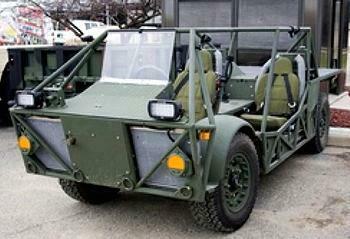 In addition to these military hybrids, 27 hybrid cars built for civilians are on display at the Chicago Auto Show. Some allow the vehicle to be driven for short distances on electric power alone and others use the electric motor as an assist to make the gas engine more efficient. Four battery powered vehicles are on the floor – the Chevrolet Volt and Nissan LEAF – as well as two new electrics from Ford. The Ford Transit Connect Electric is a front-wheel drive van powered by a 74-horsepower electric motor and a 28-kilowatt-hour battery pack. Ford claims a range of 80 miles (50 km), a top speed of 75 mph (120 kph), and a charge time of six to eight hours on a 240-volt circuit. The Ford 2012 Focus Electric is also on view although not yet on sale at dealerships. This electric car is set to be launched in 19 markets in late 2011. With a 100 mile range, the top speed will be 84 mph (136 kph). A full recharge using a 240 volt charger will only take three to four hours, about half the time it takes to charge the Nissan LEAF. This year marks the 103rd edition of the Chicago Auto Show. First staged in 1901, the Chicago Auto Show is the largest auto show in North America and has been held more times than any other auto exposition on the continent.